I woke up this morning with the worst summer cold EVER! What a way to kick off 4th of July weekend, huh? I was supposed to be sitting around a BBQ with the family today, but I doubt that’s even going to happen now. But, of course, I can’t forget about you guys! As I was scrolling through my Facebook and nursing my orange juice this morning, this awesome American flag illusion caught my eye. 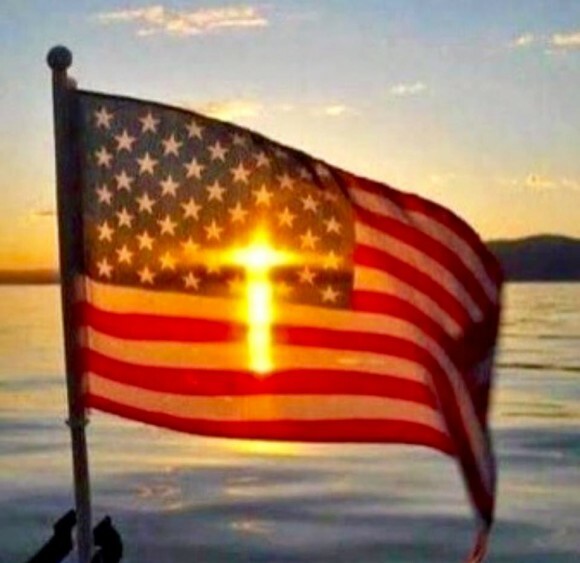 The sun in the background makes it appear as though a glowing cross is in the middle of this flag. I thought it was a pretty cool American flag optical illusion and pretty fitting for the 4th of July. What do you think? If you love this illusion as much as I do, make sure you give it a good rating with the stars below! If you liked this American flag illusion, you can check out some other American flag illusions HERE! Prev Magic Eye for the 4th of July! Next Red, White, and Blue Moving Patriotic Illusion!